WASHINGTON, DC -- Hundreds of Russian troops are still training and equipping separatists in Ukraine, NATO’s top military commander said Monday, activities that are heightening tensions with the West and Ukraine’s government that were aggravated by Sunday’s elections in the breakaway regions of eastern Ukraine. 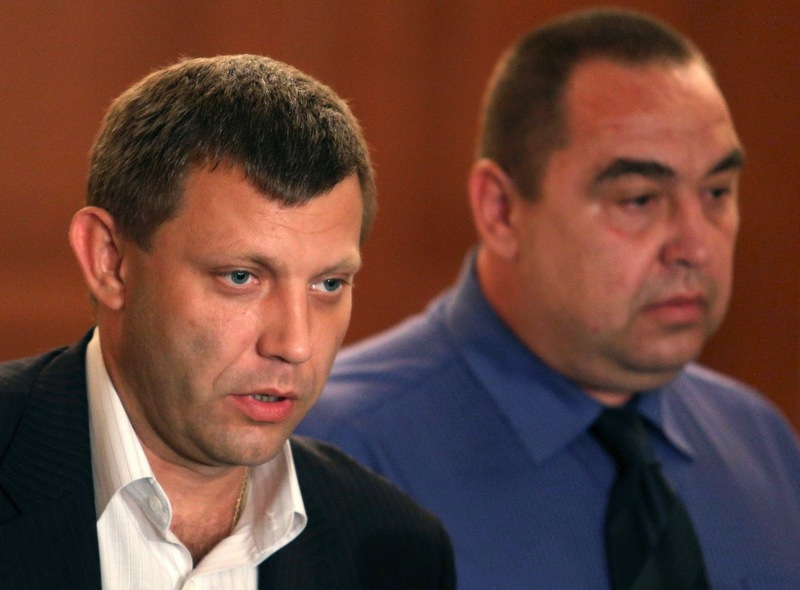 Rebel election officials said that Aleksandr Zakharchenko (L) had won in Donetsk and that Igor Plotnitsky had won in Luhansk. As the Russian Foreign Ministry appears to be moving toward recognizing the results of the voting, which was dismissed by the United States as a “sham,” Western officials are increasingly concerned that the Kremlin may be taking the steps necessary to establish an enclave that remains outside Kiev’s control. Moscow followed that blueprint after the war with Georgia in 2008, establishing enclaves in Abkhazia and South Ossetia to ensure that the territorially compromised nation could not join NATO. It did the same earlier with Transnistria, a breakaway territory of Moldova where Russians have been stationed. The concern now is that a buffer zone between Ukrainian and separatist forces, established as part of a September cease-fire, may become a de facto border of the new enclave. Meanwhile, the border between eastern Ukraine and Russia has remained open. “We have seen a general trend towards a hardening of this line of demarcation and much more softening of the actual Ukraine-Russia border,” General Breedlove said. “The Ukraine-Russia border is wide open,” he added. Though the Kremlin has denied that it has sent forces into Ukraine, General Breedlove said about 250 to 300 Russian soldiers are still in the country. “These are not fighting formations,” he said. And as the Sunday vote approached, he reported, some Russian military units edged closer to Russia’s border with Ukraine, an intimidating move that appeared intended to caution the Ukrainian government not to intervene. “Some of those formations have moved closer to the border,” General Breedlove said. On Saturday, in another show of force, a column of about 60 unmarked military trucks drove through Donetsk. In total, Russia has seven battalions near Ukraine, down from the 18 battalions — about 20,000 troops — it had there in August. But the forces are enough to maintain Russia’s influence in the area and to buttress Moscow’s efforts to help the separatists. On Monday, the Organization for Security and Cooperation in Europe reported that pro-Russian fighters had fired on one of its surveillance drones the day before as it was filming pro-Russian forces on the move near a Ukrainian checkpoint. “New drones under fire east of the contact line,” the group said in a post on Twitter. The organization issued a statement saying the drone was flying at an altitude of about 5,000 feet near Mariupol, in the south of the Donetsk region, on the pro-Russian side of the front. It was filming a civilian truck when “a canvas covering on the back of the truck was removed, revealing a truck-mounted antiaircraft gun, which immediately fired numerous rounds” at the drone but missed. Russia’s president, Vladimir V. Putin, has said he does not want a crystallization of the status quo into a frozen conflict, but the Russian Foreign Ministry nevertheless issued a statement saying it would respect the outcome of separatist elections. Russia “respects the choice made by residents of the southeast” of Ukraine, Russia’s deputy foreign minister, Grigory Karasin, later told the Interfax news agency. “Our position is that the elected representatives of the Donetsk and Luhansk regions thereby received a mandate to hold negotiations with the central Ukrainian authorities and, acting as part of their political dialogue, tackle all the problems that have accumulated over many months,” Karasin said. The ministry statement stopped short of recognizing the outcome of the vote, but still drew a din of criticism from European officials. The turn of events in the rebellious territories ruled out any early lifting of European sanctions imposed on Russia and could lead to further sanctions if security deteriorated, Mr. Seibert said. President Petro O. Poroshenko described Sunday’s elections as a farce. The rebel central election committee in Donetsk said Aleksandr Zakharchenko, a former electrician, had won the election with about 78 percent of the vote. Zakharchenko commanded a pro-Russian militia, Oplot, until August, when the Donetsk Supreme Soviet elevated him to prime minister, replacing a Russian citizen in a leadership shuffle intended to put a local face on the movement. Zakharchenko is a Russian-speaking ethnic Ukrainian. In Luhansk, election officials said Igor Plotnitsky, a former public health inspector, had won with about 63 percent of the vote. The elections in both regions offered few plausible alternatives, and separatist officials said the purpose of the voting was to legitimize the leadership and compel Kiev to negotiate with them.